The Filet-O-Fish is one of the more curious items on the McDonald’s menu in that it receives virtually no advertising whatsoever, yet still continues to be sold by the chain despite the fact that it seems like nobody ever orders one and it’s been a problem item for years for the company due to difficulty in finding a sustainable, tasty source of fish meat at the volume the behemoth needs, as well as the fact that it requires a separate fryer to cook in than their other items. As it turns out, they keep it around because the Filet-O-Fish is actually intended to be eaten by a very specific kind of customer- people who abstain from eating non-seafood meat for religious reasons. Catholics told to abstain from eating meat on Fridays. 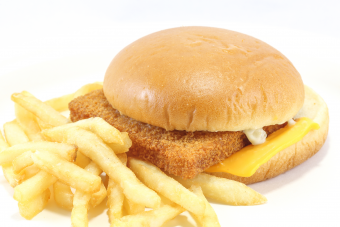 Ask McArdle: Do people actually eat Filet-o-Fish sandwiches? It’s actually quite good, as I recall. Very tiny tho. Get two. By the time you realize “Hey, this isn’t too bad, all things considered”, it’ll be gone. Eh, maybe. Just concerned about what they’ve done with hamburgers they might do with fish. Which is to say a McDonald’s hamburger is a brand not a burger. Compared to a real burger, it isn’t, but as a brand it’s a phenomena. But then, I live in the South after growing up in Seattle. There is no good fish down here compared to the Northwest. As far as I know, there is nowhere in the world that Catholics are enjoined from eating meat on Saturdays. The days of abstinence traditionally were all Fridays, Ash Wednesday and Christmas Eve. In most regions it is now Fridays of Lent, Good Friday and Ash Wednesday. My understanding is that before Vatican II, all of Lent was meatless as well as Fridays during the rest of the year. The habit probably stuck with a lot of people after the Council, too. I love the Filet-o-Fish. Always have, even before I turned Catholic. It’s my go-to order at McDonald’s. Catholics are not the only group who are potential filet of fish customers. Orthodox Christians abstain from meat Wednesdays and Fridays, every day during the latter part of Lent, and several other times during the year. I do wish the fish was Halibut and not Pollack though- I would pay more for that selection.